Make your life more colorful and fun with Mermaid Pillow! Do you want a Magic Sequined Pillow that you can write hi, boo, love and other short words in the sequence. Jing Great Pillow made from two colors of the reversible sequin. When you slide your fingers across it, the reversible sequins flip colors allowing you to create funky designs, monograms and other shapes. When you want to erase your design, all you have to do is slide your hand over the sequins again in the opposite direction. It's like a shimmery Magna Doodle for your couch, and people can't get enough of it. *Application: Office, Home, Bedroom, Drawing Room, Sofa, Car, Festival Decorative, Saloon, Club, Bar ect. Note: please allow 1-2cm differs due to manual measurement, thanks. As different computers display colors differently, the color of the actual item may vary slightly from the above images, thanks for your understanding. GERAT JING will provide you with inexpensive products and the most attentive service. We promise never let you suffer lose .So please contact us first if the product do not match your expectations. 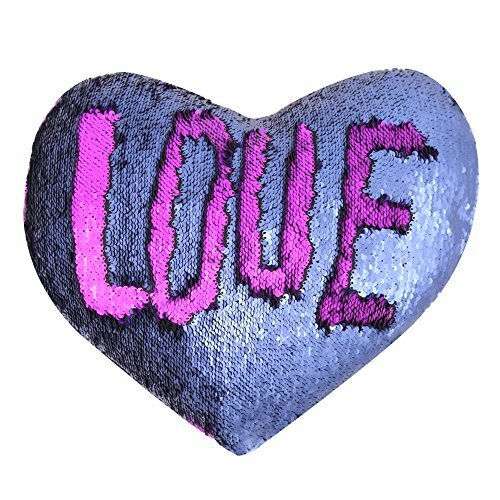 Heart Shape Mermaid Pilllow, with Pilllow Insert, One side with quality reversible sequin, Writable to make fun on a sofa relax time. Material: Polyester and Sequin; The front is with high quality encrypted two-color sequins are 100% guaranteed, and the back with high-grade comfortable soft suede cloth. Size: Approx.13"*15" (35CM x 40CM). Package Include: 1 pcs Heart Shape Mermaid Pillow with pillow insert. With any questions, welcome to contact us directly. If you have any questions about this product by J-hong, contact us by completing and submitting the form below. If you are looking for a specif part number, please include it with your message.